Trek & climb of Mardi Himal at 5.555 meters also known as the four fives peaks situated in the hidden corners of other side of the Annapurna Sanctuary, let Great Adventure Treks & Expeditions show you the magic of Himalaya around the Annapurna region with breathtaking scenery of the surrounding landscapes and tall mountains of Annapurna I A South and Huinchuli peak, Gangapurna, Glacier Dome, A II, A IV , Lamjung Himal and towards east the Manaslu range of mountains, Mardi Himal located just beneath the towering Mt.Macchhapuchere Approximately 15 miles north of Pokhara, as the crow flies, this mountain is the most southerly of the Annapurna range. From some viewpoints it seems little more than an outlier on the southwest flank of Mt. Machhapuchare (Fish Tail). 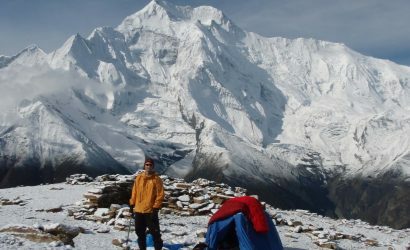 Mardi Himal is the lowest and least climbed and visited of all the trekking peaks in Nepal. As it is lowly altitude the mountain obviously has a great deal of potential for those interested in small scale exploratory climbing and the ridges will certainly present climbing challenges at a reasonable standard. Great Adventure professional guides will lead and support you all the way to the top summit of Mardi Himal at 5,555 meters. 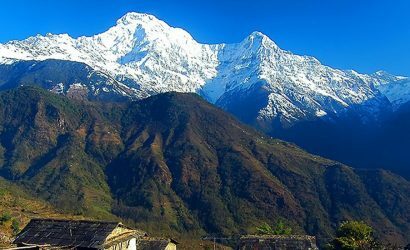 This rarely visited area provides a tough trek isolated from the teahouses and lodges, which dominate most of the trekking in and around the Annapurna Range. So, this will be an exciting adventure to Mardi Himal with Great Adventure Treks & Expeditions in this isolated region within Annapurna range. Western mountaineers first noticed this mountain by the photographs of Basil Good fellow, taken in 1953. It was climbed to its summit by a route on its east flank by Jimmy Roberts with two Sherpa. As seen from the south, Mardi Himal terminated the Southwest ridge of Mt. Machhapuchare as a distinct and separate mass, at right angles to that ridge. On Mardi Himal’s South West Face are three well-defined ridges rising from rock buttresses and separated by hanging glaciers. It is the most southerly of these is said to have been climbed, but no such details has been recorded. Mardi Himal’s East Face is separated from Mt. 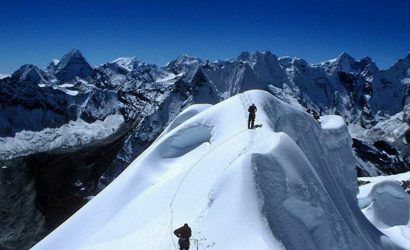 Machhapuchare ridge by a col (circa 5,200m/17,060ft). The normal route of ascent reaches this col from glaciated amphitheatre that rises above a hidden plateau, also known as ‘Other Sanctuary’. The trail to base camp is short and sharp on ill-defined trails that would be particularly difficult in wet and snowy conditions. Day 5: Trek to Sano Khoban (1,600m). Day 6: Trek to Pipa (3,150m). Day 8: Trek to Thulo Kharka (4,120m). Day 9: Trek to Base Camp (4,100m). Day 11: Climb to High Camp (4,650m). Day 12: Climb Mardi Himal (5,555m). 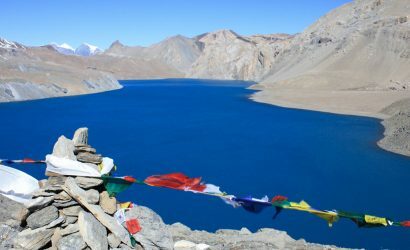 Day 13: Trek to Korchon (3,680m). Day 14: Trek to Riban (1,780m). Day 15: Trek to Hyenja, drive to Pokhara. Day 16: Return flight to Kathmandu. Arrive in Kathmandu and transfer to the hotel and welcome dinner in the evening with typical Nepalese food. Sightseeing to the highlighted areas of capital city Kathmandu and prepare the official documents such as climbing permit. After reaching Pokhara, We will stay there overnight. if time permits, you can go wander around in beautiful city Pokhara. We make an early start for the 6-hour drive to Pokhara, Nepal's second largest town some 198 km to the west. Stopping at the village of Hyenja, we then set off on foot, along the bank of the Mardi Khola which is soon crossed via a rope bridge. We then follow the Seti Kola, through farmed terraces to the village of Gyachok, where we camp for the night. Good views of Machhapuchhre and Mardi Himal. After breakfast we walk through the village with its beautifully built houses and dry stonewalls, and friendly villagers. As we climb higher through the paddy field terraces, the much busier villages on the opposite side of the valley become visible. A good track contours along the hillside to Dhiprang and later we reach a super lunch spot by the river. We then pass two more villages, Mirsa and Kaduwa, which are the last settlements we will see until our return trek. The day finishes with a steep climb to the pastureland of Sano Khoban, where we camp. The trail continues steeply, now through forest. The only clearing in the forest is about 1 ½ hours from Sano Khoban, so we may well stop for an early lunch. Then it is a long up-hill struggle through dense forest until we reach 2,900m, where we break out into the open air. A very steep ridge then leads to the small lake at Pipa. Yesterday was a long day and we ascended 1,500m, so today is a welcome rest day, to help us acclimatize to the altitude. There is a stream suitable for washing about 20 minutes from the campsite. We continue up the ridgeline, with fantastic views stretching from the Manaslu group in the east, across the Annapurna to Dhaulagiri in the far west. Eventually we arrive at the pleasant grazing area of Thulo Kharka. 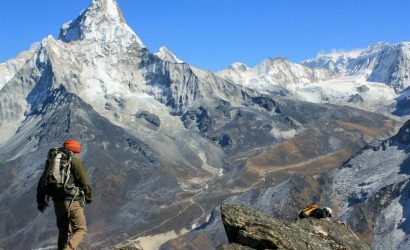 This is a short day and the whole route to base camp is visible from Thulo Kharka. It takes about 2 hours to reach it, where it sits in the obvious valley, which descends between the south and southeast ridges of Mardi Himal. Another important acclimatization day. It is best to rest during this period rather than try and do too much - there will be plenty of opportunity for exertion later! It takes about 2 hours to reach the high camp, our take-off point for the summit. First we climb straight up for 200m then traverse around the south-east ridge. A steady climb on rocks and perhaps some snow then leads to the camp site. This is in a good sheltered location but water is scarce and may involve melting snow. Make sure your water bottles are full at the beginning of the day! With 900m of ascent before us, we need to make a very early start to ensure success. 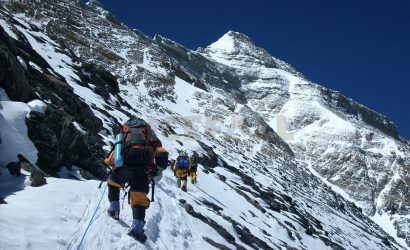 The first part of the climb is the couloir leading to the East Col (5,400m), between Mardi Himal and Machhapuchare. The base of the couloir is at 4,950m, where we will most likely need to put on crampons. The couloir is a very long snow climb, not steep, but it is sustained and tiring, and it will take about 4 hours to reach the col. On the col it will probably be quite windy (unless we are very lucky), but it is only an hour or so to the top, up a pleasant snow ridge. Once on the summit, we can rest and enjoy being on a Nepalese summit in the midst of the Himalaya. After taking photos and perhaps having a bite to eat, we descend to the high camp and then continue to base camp for a good meal. We take a different route back to Pokhara which stays high up on ridges to allow us to enjoy the views for longer. From base camp we traverse the south ridge to reach a col at 4,280m. We then stay up on the ridge, following it with wonderful views, to Korchon where we camp. The ridge line continues to Odane Hill. The descent is steep and awkward, being on tussock grass with hidden holes, so care is needed. However, the trail is marked and eventually the grass gives way to forest. Soon after we reach the col below Odane Hill, which is a good view point. Following the ridge line south, we emerge out of the forest above Riban. This is our last evening on trek so it is usual to sample the local brew and have a sing-song with the Sherpas - they are always happiest when the hard work is over! The final part of the trek is a lovely walk through Riban and on to Lachock. We cross the Mardi Khola and Mardi Pul which is an excellent lunch spot. Then it's a short walk to Hyenja where we are met by our bus whisks us to the luxury of the Fish Tail Lodge, on of Nepal's most celebrated hotels. It's buildings sprawl across a small island in Pewa Tal, the picturesque lake beside Pokhara. From here we can look back towards Machhapuchare and Mardi Himal, while sitting on the terrace drinking beer! Today we fly back from Pokhara to Kathmandu and the Hotel, where we can celebrate the success of our expedition in fine style. Give a good rest to your tired bones, wander around Kathmandu city and give a good look to the city and people of Kathmandu before you say goodbye to this beautiful country. Our representative will drop you off at the TIA (Tribhuvan International Airport) for your flight to your next destination.